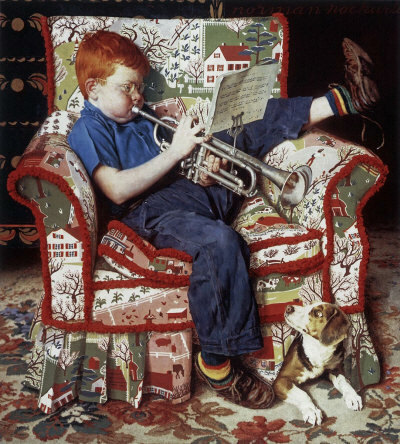 Boy Practicing Trumpet, a Norman Rockwell painting , appeared on the cover of The Saturday Evening Post published November 18, 1950. This is yet another favorite of Rockwell collectors, a classic enduring image of the world Rockwell painted. This painting was Rockwell's 266th overall out of 322 total paintings that were published on the cover of the Saturday Evening Post. Rockwell's career with the Post spanned 47 years, from his first cover illustration, Boy With Baby Carriage in 1916 to his last, Portrait of John F. Kennedy, in 1963. This was also the fourth cover for The Post in 1950. In 1950, there were four Norman Rockwell Saturday Evening Post covers published. A study also appears on page 187 of the Norman Rockwell Catalogue. The model Norman Rockwell used for thispainting was Tommy Paquin. During this period, Rockwell used several red-haired models, one example being The Census Taker. This boy has been described as chubby-cheeked. I remember frommy days in high school band how playing the trumpet can make the cheeks bulge, just like shown in this painting. The trumpet was borrowed from Rockwell's middle son, Tommy. The slip covers for the chair are painted after the fashion of Rockwell's good friend, Grandma Moses. We can safely assume that she was flattered by the emulation. Boy Practicing Trumpet was only one of 322 Norman Rockwell Saturday Evening Post covers; Here is the list of Norman Rockwell Saturday Evening Post cover illustrations. It is said that Rockwell came up with the pose the trumpeter has assumed after a conversation with Saturday Evening Post editor, Ben Hibbs. Hibbs was commenting,in the course of conversation, about the unusual body positions his son Steve would get himself into as he practiced his trumpet. We can only wonder when the dog, the only apparent audience that the trumpet player has, will bolt and run out of earshot. Surely he is not planning to make the practice session a duet between trumpet and howl. That might offend the trumpet player. Do You Have A Great Story, Opinion Or Contribution About Boy Practicing Trumpet?